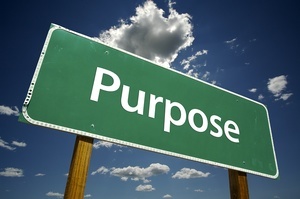 Yesterday I posed the question: What is the purpose of church? It seems, at least based upon the comments left, that many of us agree on the answer to this question. Yet, as I set out to write this post, I did a little research to see how others answered this question. There are wildly varying answers, to be sure. After a quick Google search, I found thousands of articles and blog posts asking this very same question, each with a different answer. When you strip it all down, and really look at God’s Word, I believe the purpose of the church is to glorify and worship God as a collective body of believers. Our purpose is not to simply (or only) make disciples. It is not to evangelize or feed the poor. It is not even to make “little Christs” as Lewis explains. I believe that many of the actions listed above are functions or by-products of the church, but they are not the main purpose of the Church. It may sound like semantics, but the distinction is an important one. The Body of Christ does not exist to convert others or preach the Gospel. We exist to bring glory to God as His holy ones. The result of which, when practiced in line with scripture then results in the feeding of the poor, the Gospel preached, and disciples being made. The results we desire to see in the Church spring forth from understanding our true purpose. Not the other way around. Secondly, the church exists to edify and equip the saints. This one, it seems, a lot of Christians have a hard time swallowing. I have known believers who think that a Sunday morning service or home group should be almost entirely seeker-focused. They feel convinced that a Sunday morning message must feed the lost and not the body. To be clear, I don’t disagree with C.S. Lewis that one of the functions of the Church should be to make “little Christs.” However, I do not believe this is the reason the Church exists. It exists to glorify God as we worship Him as His body and it exists to edify one another. A world filled with Christ-followers is and should be the result of achieving our purpose. The Holy Spirit, here, among us, and indwelling in us, has given us the power to do so. But only in recognizing and accomplishing our first and true purposes can we truly reach those who are yet to know the One. Do you agree or disagree with my answer tot he question? What do you think is the purpose of the Church? Have you ever thought strictly in terms of reaching the lost and not edifying the saints (I have)? How can the Church fulfill its purpose? WEll done. Here is a quote from Keith Giles “Swimming won’t make you a fish but if you are a fish you will swim.” Basically all those things that are thought to be the purpose of the church (evangelize, care for the poor, etc.) are characteristics the flow from the church that is fulfilling its purpose. I recently read “Coffee Shop Conversations” by Dale Fincher. He covers the use of the word glorify in his chapter on christian-ized words. It simply means to make Gods reputation better; just like a battle-scarred war hero receives “glory” for his act. Great comment! Thanks. I also love that simple definition of “glorify” –to improve God’s reputation. It sounds so simple, and yet involves so much. Great analogy too of a war hero. Thanks for sharing and being a part of this discussion. The Church is supposed to be producing a whole bunch of Jesus imitators who are following Him, in the power of His Spirit, doing even greater works than He did (John 14:12). Obviously, the predominant version of today’s church is not getting that job done. that we might bring the glory and honor due to His Name. I completely agree with you, but it’s very hard to find a church body that gets this. My current church is so focused on evangelizing our community that it’s doing very little to equip the saints sitting in the services every week. We’ve got a community of “baby Christians” who are staying babies because they are not being given the things they need to grow – therefore they are not equipped to “be Christ” in the community. Focusing on evangelism before everything else makes evangelism virtually impossible. It’s very frustrating to see and understand what is happening and not be able to do much about it. Mina, I totally relate to your comment. I’m on pastoral staff at a church like yours. I’m really at a point of realizing the true purpose of the local church….To gather together as the Body of Christ for corporate worship, and to equip the Body of Christ to continue Jesus’ ministry, as we walk our lives as Jesus walked His life on this earth. I like the following quote from The Middletown Bible Church in Middletown, CT……”God does not say, Go into all the world and invite everyone to come to church. We are not to bring them to the gospel but we are to bring the gospel to them”. In closing, I believe there is a tragic, vicious cycle going on that believes that the local church has to be the evangelism tool, because the Body of Christ isn’t doing what they are called to do. But, the Body of Christ isn’t doing what they are called to do, because they aren’t being equipped properly. For the most part I agree with you. However, I think that the way we glorify and worship God is by our actions. By acting in the fully human way that God intended us to live. I think that to say that there is a main purpose to the church is to try and simplify things too much. So, in that way CS Lewis was correct; we draw men into Christ by reflecting his image into the world, and we come together to learn from, and encourage each other in this endeavor. I read your post several times and I find that I am in complete agreement. I’m wondering however when did the American church lose sight of their true purpose? What I am witnessing in my church is desperation for new membership and retaining current membership. They reach out to the “seeker” by presenting the church as “one of them” but with a loving God. Problem with that is God is often muted that not only do new seekers see no difference in us but also the believers within the church do not disciple one another. We don’t have the time to disciple one another because we need to assemble to assist a local little league have a good time. (not just one team but the entire league) But hey it’s a partnership with those organizations in the city that can compliment what we do as a church. Good grief! Interesting study and provocative. The book of Acts reveals the work of the church, to evangelize and edify. The doctrine of evangelism is gained by studying the book of Acts. Then we look to the letters for life as a Christian, being transformed into the image of Christ. Benevolence is particularly shown to the brethren, but maybe not exclusively. The church is the body of Christ, born again people meeting together to meet the needs of the whole, encouraged each other to face trails realizing God is with us, being taught to live for Christ (Holiness, Service, Evangelism), to pray for one another, and to worship the Lord as a congregation of grateful saints (sing, Lord’s Supper, etc.). Thanks for your thoughts here and please don’t consider this “snarky”. That was definitely not my intention. By the way, I got to this article via a link in your piece recently posted to Curchleaders.com. “6 Deadly Lies We Believe About The Church.” That piece was EXCELLENT! I understand that you wrote this article some time ago, but I just came to it through churchleaders.com and felt it necessary to offer some insight. Consider for one second the question: Would you be able to say, “I am a Christian” were it not for the gospel message being proclaimed? Had someone never considered sharing the gospel as an essential purpose of the church, then you and I would never have heard and been transformed by the gospel (See Romans 10:14-17 … the necessity of the messenger). Consider if all apostles received the Holy Spirit in Acts 2 and then they just started building up and edifying each other as saints, but they never went out and spoke the gospel. Would the church have grown? NO. Instead we see in Matthew 4:19, Matthew 28:19-20, Acts 1:8 that Jesus (he should be fairly credible witness about the purpose of his church) teaches that fishing for men, making disciples, and being witnesses of Christ to the end of the earth are the purpose of the church. Interestingly, when the apostles receive the Holy Spirit in Acts 2, the very first thing that happens is that the gospel is proclaimed and 3000 people are welcomed into the fold of God. I have a funny feeling that if the purpose of the church was simply edifying by the power of the Holy Spirit as you state from either 1 Corinthians or Ephesians 4 (sorry I can’t remember what you quoted), then the first thing God would have done by the power of the Holy Spirit would have been to edify each other instead of the spread the gospel message and save 3000 people. I am by no means suggesting the edification, and holy living, and glorifying God are not absolutely essential, but to say that the purpose of the church is something other then what Jesus himself said is painfully inaccurate. Even in the the Sermon on the Mount (MT 5:16) Jesus says to let your light shine so people will see your good deeds, and glorify the father in heaven. Clearly the implication is that righteous living will assist in the process of making disciples (others that glorify God). On the flip side, I am also not suggesting that the seeker friendly model of church is correct. I personally think that Jesus modeled the life and purpose that we are called to. Jesus sought out 12 disciples, and he fully trained and prepared them to then go and make disciples as well. This involved such a dynamic work of living together, teaching, training, edifying, and building up these disciples … but even Jesus did all this with the purpose of releasing them to go make disciples. Read through Jesus’ prayer in John 17 sometime. Jesus says, that he is now ready to be glorified and to glorify the Father BECAUSE he has completed the work that the Father gave him to do. Jesus himself describes this work as bringing the disciples to a complete knowledge and understanding of the Father and so to eternal life. Jesus then prays for these disciples as well as those who will come to the knowledge of Jesus through their message (17:20). Clearly Jesus expected them to go make disciples … not just to “build each other up”. Quite the contrary, they were to go build OTHERS up just as Jesus had built them up. Remember, these same disciples were previously tax collectors and fisherman … they were the others that the disciples would soon reach. They would not have been disciples had Jesus not come with a message “repent for the kingdom of heaven is near” and “follow me and I will make you fishers of men”. Of course, this is not accomplished at the expense of building each other up. In Acts 4, we see the body of believers come together to build each other up … however, this is a response to the persecution that Peter and John recently faced for sharing the gospel. Furthermore, immediately after “building each other up” we’re told that the Holy Spirit came upon all the believers and everyone WENT OUT AND SPOKE the gospel boldly. Why would they do that if it wasn’t their purpose. If Jesus hadn’t clearly communicated this purpose, then the church would have stopped sharing the gospel when faced with persecution. You don’t willingly face persecution for sharing a message if it hasn’t already been clearly communicated that sharing this message is your purpose. Needless to say, there is so much more that could be said on this topic, but not enough time or space. Sorry to have written so much, but I trust that this will challenge you and hopefully your readers as you consider your understanding and role of the church. I hope that I have not offended you in anything that I have said. God Bless you as you continue your walk with Him. Maybe I’m missing something but it seems to me that evangelizing, discipling and equipping the saints are only parts of a singe process. Not three different processes. I think the great commission is the main purpose of the church, but it does not stop and a commitment to Christ, the work of the church only begins there. How true this is, I’m surprised when I see this topic that Eph 3:10 is not mentioned more often. I found this blog as I was doing research as I write an email to those in our Church who are looking for a Men’s Ministry Pastor. After the line below (______) is some of my text in the email, to give context as to how this subject fits in. Please feel free to give any input as to if I’m on the right track. From the – MacArthur New Testament Commentary – Ephesians (3:10). With this said, my thought is that the best course in looking for a Men’s Ministry Pastor is finding someone who has a heart for men but who’s dominate trait is a deep, deep Love for God’s word. He should have a dependence and concentration on what is biblical not what is cool, trendy or draws the biggest response, someone the Men of Bayside can emulate and see examples of an identity in Christ and confidence from God. Possibly even someone that is not specifically in men’s ministries but someone who’s passion is teaching how we should live, teaching how to love God in ways scripture prescribes. Bayside has a great reputation for great works and service and entertainment and being a fun place to find out about God. What if with all that, Bayside had a reputation for men, of all levels and statuses, who are different, in the world but not of the world, who stand out as foreigners in today’s culture. Many churches are trying to fit into the culture so people will be attracted and feel comfortable, this is not what God has called His church to do. From the – MacArthur New Testament Commentary (Ephesians 3:10) ……………….